Taking a leaf out of Book Oblivion’s post, I too thought it would be fun to check which author I have read the most books from. Like I mentioned in the comments section of Book Oblivion’s post, I had a feeling Wodehouse and Agatha Christie would easily top my list. The results corroborated my gut feeling, but were also somewhat of a blast from the past. 1. P. G. Wodehouse – This was a no-brainer. I love Wodehouse. The language, the poetry-like-flow of words, the outlandish plots, the humour: all of this makes the perfect pick-me-up book, and the only surprise here is that I’ve read only 23 of his books. 2. Sidney Sheldon – This one was a pleasant surprise. I still vividly remember picking up my first Sidney Sheldon novel, ‘The Naked Face’, from my school library, which incidentally, was also Sheldon’s first novel. This was my introduction to the world of bestsellers and contemporary fiction. Till then, I’d only been reading a lot of Noddy, Hardy Boys, Nancy Drew, The Three Musketeers and of course, Enid Blyton’s books. After ‘The Naked Face’, my reading habit completely changed. 3. Agatha Christie – What can I say about the Dame that hasn’t already been said before? I love the plots and I love the quirks. Be it Poirot, Miss Marple or any of the short stories that Christie wrote early in her career; I gobbled all of them with glee. I still feel ‘And Then There Were None’ is the BEST crime novel I will ever read, though I still have ‘The Murder of Roger Ackroyd’ on my to-read list. Nope, don’t try it. I already know who the killer is. 4. Jeffrey Archer – After I was through with my Sidney Sheldon phase, I started looking elsewhere for similar thrills in contemporary fiction. I found my answer in Jeffrey Archer, especially when I read ‘Kane & Abel’. I recently read the book again and was delighted to find that I still enjoyed it as much as I had when I was in high school. 5. John Grisham – Right alongside the Archer books, I was reading one courtroom thriller after another by John Grisham. I think the one that really got me hooked to his writing was ‘The Firm’ (I haven’t seen the film starring Tom Cruise), but I loved almost all of his novels. One which really stands out in my memory is ‘The Chamber’, which some of my friends didn’t like, but I absolutely loved. Incidentally, the first book that I read by Grisham was ‘A Time To Kill’, also his first novel. 6. J. K. Rowling – Seven books. Seven gems. Although I loved the initial Harry Potter books more because they were such light reading and weren’t filled with too much drama and menace and philosophical ideas about love and life and death, I still marvel at how brilliantly she brought so many plots together over the last couple of books. Absolutely stunning! 7. Ashok Banker – I remember stumbling across the novel ‘Prince of Ayodhya’, the first in Ashok Banker’s Ramayana series, at the library in my MBA college. I was thunderstruck by the twist that Banker had given a tale that I’d long thought as fuddy-duddy, echoes from the time that I saw the Ramanand Sagar TV series as a child. Tip: Definitely read the preface to the books, which has a brilliant argument why every Ramayana tale that you will ever hear is unique. 8. Alistair MacLean – By the time I discovered Goodreads, I couldn’t recall all the books by MacLean that I’d read. 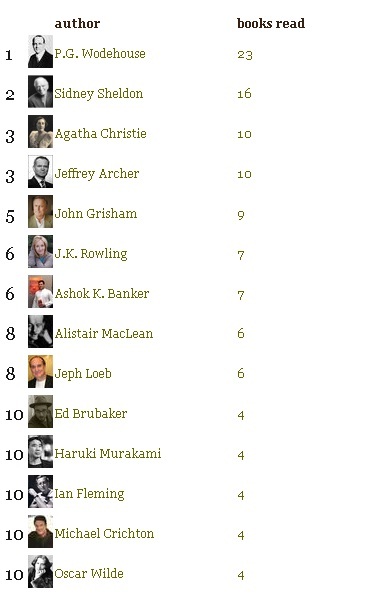 If I did, he (and Frederick Forsyth) would definitely feature much higher on this list. These were the perfect thrillers concerning war and espionage that I could’ve read while growing up as a boy. Please, please read ‘The Guns Of Navarone’ to find out what I’m saying. 9 & 10. Jeph Loeb & Ed Brubaker – The reason I’m considering these two together is because the wizardry of the author and the artist have combined to give some of the finest Batman graphic novels that I’ve read. Read Batman: Hush, The Dark Victory, The Long Halloween and The Man Who Laughs. 11. Haruki Murakami – Ever since I read ‘What I Talk About When I Talk About Running’, I’ve been in love with Murakami’s works. Agreed, he has sometimes gone overboard (Blind Willow, Sleeping Woman), but I would still any day settle down to read any of his eccentric works. 12. Ian Fleming – I read ‘Goldfinger’ as a schoolboy and then explored the world of James Bond a bit as I grew up. But I still have a box-set of James Bond novels that I’m determined to read some day and relish the stories of this dashing spy. 13. Michael Crichton – Right about the time I was reading those courtroom thrillers by John Grisham, I’d also started reading some sci-fi by Michael Crichton. I loved ‘Jurassic Park’ and ‘The Lost World’ and was chilled to the bone by ‘Congo’. 14. Oscar Wilde – The last, and by no means the least, on this list is Oscar Wilde. I have only recently started reading his books and love his works. I have a feeling I’ll be reading a lot, lot more of his stories in the near future. Love his irreverence. If you are on Goodreads, and want to check your list of most read authors, just go to your Read page and scroll down to the ‘most read authors’ link on the left column. So, what are the authors that you’ve read the most books by?